Horse landed badly from jump and became acutely lame. 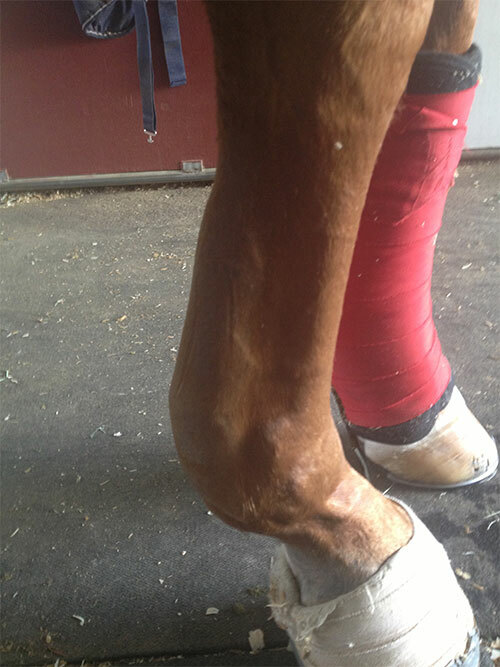 On initial presentation, horse had severe swelling in the flexor tendon region. 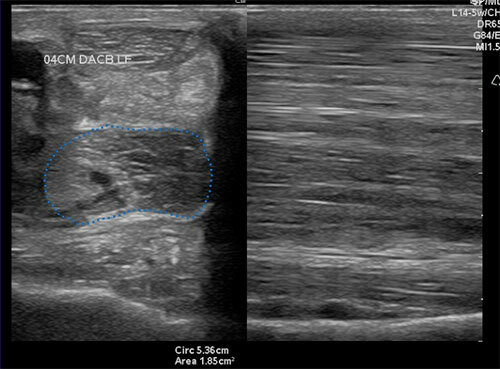 Ultrasound examination confirmed tendonitis of the SDF. Small multifocal tears and diffuse hypoechogenicity was visualized in approximately 2/3 of the tendon’s length in the metacarpal region. Initial treatment included icing, anti-inflammatories, bandaging, and wedge pads taped to the foot to help elevate the heel. Platelet-rich plasma was also infused into the lesion under ultrasound guidance. Current Status: 3 months post injury-Horse is sound at the walk and is being tack-walked. Significant dental abnormalities found during a routine dental examination. 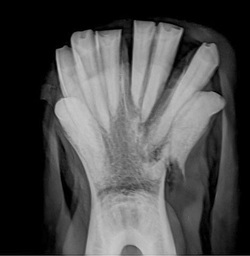 Dental radiographs identified supernumerary (extra) cheek teeth in the left maxillary arcade, one large malformed cheek tooth and one fractured cheek tooth. 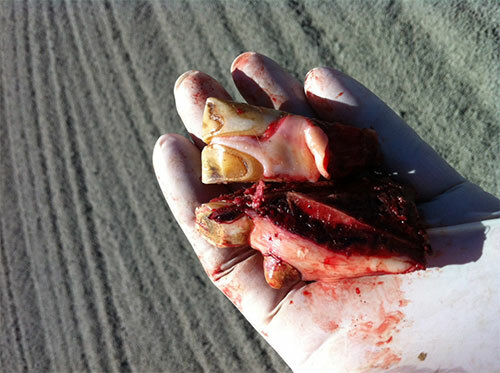 Horse sent to UC Davis for Skull CT, which identified the presence of double molars along the left maxillary arcade. 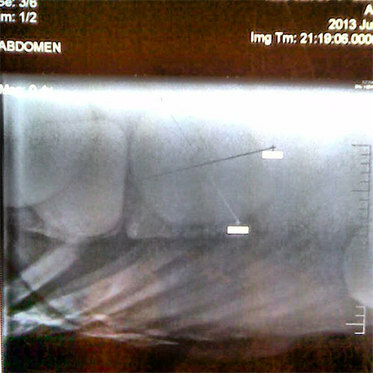 Dental specialist, Dr. Travis Henry, provided initial treatment, which included buccotomy and extractions of three of the supernumerary teeth, antibiotics and anti-inflammatories. Remaining extractions will be done at a later date. Horse was in an altercation with another horse in pasture. 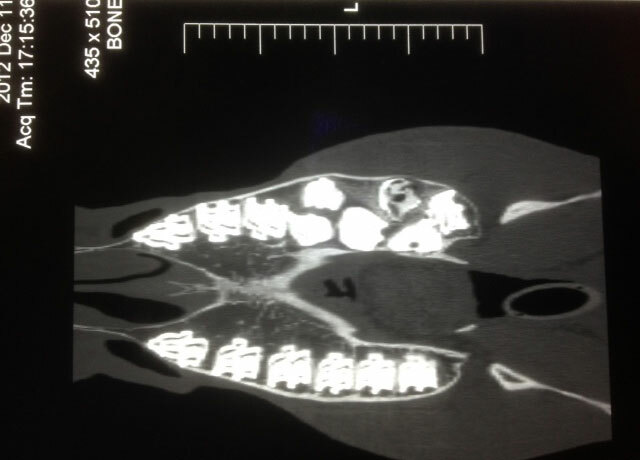 On presentation, we found a large open defect on lower left mandibular jaw, and three of the lower teeth appeared fractured and dislodged from their respected tooth roots. Intra-oral radiographs confirmed a mandibular jaw fracture. An insufficient amount of exposed tooth on the back premolars prevented us from securing the fracture with tension band wires. The horse was anesthetized and the affected teeth and bony fragments were extracted. Treatment included daily lavaging of oral cavity, antibiotics, anti-inflammatories and gastric protectants. Current status: Horse has returned to pasture and eats normally. Horse was initially seen for a mild colic. Her heart rate, GI sounds, and rectal examination were all normal. After 24 hours, horse was unresponsive to medical treatments in the field and was referred to UC Davis for suspicion of a surgical lesion. Horse is fed a 100% alfalfa feed diet and has no previous history of colic. Abdominal radiographs identified 5 enteroliths (mineral struvite) in the ventral abdomen. 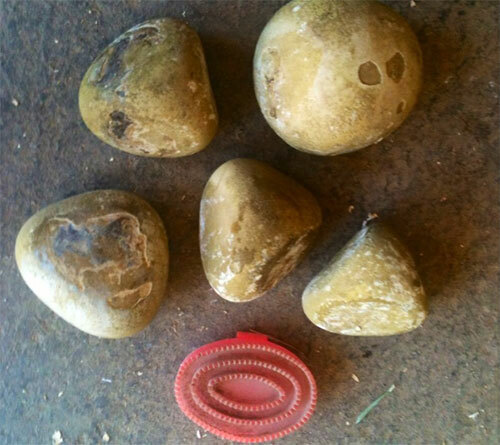 Horse was immediately taken to surgery for removal of the enteroliths. Abdominal radiographs showing the round mineral opacity structures in the ventral abdomen. Horse came up acutely lame in pasture one day. 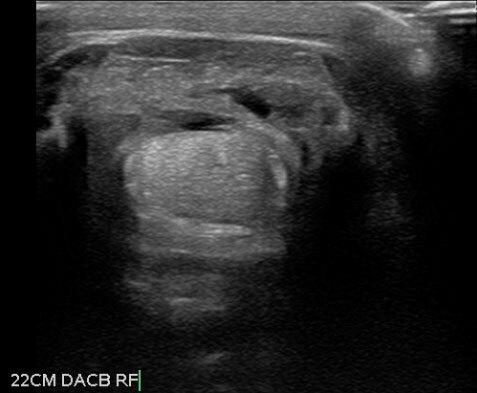 On initial presentation, severe swelling in the proximal palmarolateral metacarpal region. 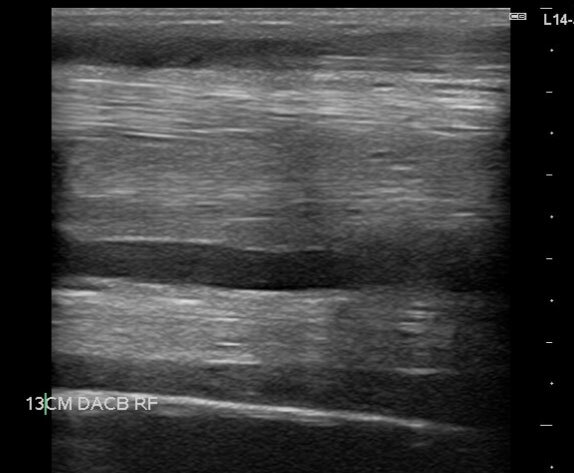 Ultrasound examination confirmed desmitis of the ICL. 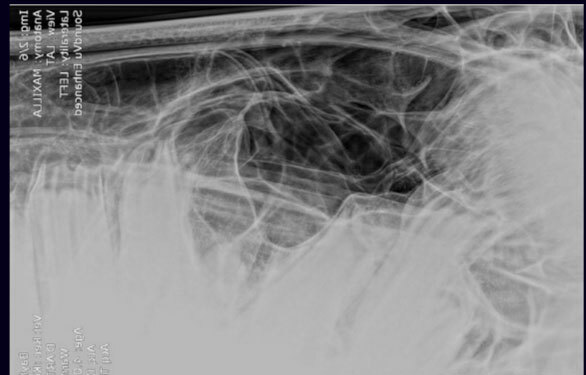 The ligament showed an increase in the cross-sectional area and had diffuse hypoechogenicity. Initial treatment included stall confinement, icing, anti-inflammatories, bandaging, and acoustic shock wave treatments.